The B-26 Invader was a larger, more ruggedly built version of the A-20 Havoc with more powerful engines, longer range, and heavier armament with remote power-driven gun turrets. It had a three man crew including a pilot, navigator and bombardier. It had the same high shoulder wing, but it was changed to a laminar flow design, the same type of wing that gave the P-51 Mustang its phenomenal performance. It was powered by 2,000 hp (1,490 kW) Pratt & Whitney R-2800s, which allowed it to pack more punch in the way of armament. There were many technological advances made during the war and the Invader took full advantage of them. One version had an incredible 18 forward firing 0.50 caliber machine guns. It remained in service for more than 25 years, while other light and medium bombers, such as the A-20 Havoc and B-26 Marauder, were scrapped as soon as the war was over. After World War II, the Invader served in Korea and Vietnam, making it the only American bomber to fly missions in three wars. The Invader came in some 700 lbs. (317 kg) below its designed weight and it was able to carry more than twice as many bombs than the USAAC requirement. Unlike the Havoc, that incorporated flaps that were slow to deploy and somewhat ineffective, the flaps on the Invader were double slotted and moved backward as well as down creating greater lift during takeoff and landing. A lot of thought went into its defensive armaments and this caused some delays before production began. The first production attack version was the A-26B and it carried six 0.50 caliber machine guns, which was later increased to eight. There were two in the nose and two in each dorsal and ventral turret. The bomb load was increased to 4,000 lbs (1,815 kg) and it was powered by two 2,000 hp (1,490 kW) R-2800-27 or -71 engines. Gun blisters were mounted under the wing and later replaced with three internally mounted 0.50 caliber machine guns. In the Pacific, the A-26 made its combat debut in July 1944 with the Fifth Air Force on New Guinea. The pilots in the 3rd Bomb Group's 13th Squadron, "The Grim Reapers", received the first four A-26s for evaluation and found the view from the cockpit to be poor for low-level attack. Visibility was greatly limited with the pilot positioned between the engine nacelles making it difficult to spot well hidden Japanese positions in the jungle. Forward-firing armament was also considered inadequate. General George Kenney, commander of the Far East Air Forces stated that, "We do not want the A-26 under any circumstances as a replacement for anything." Until changes could be made, the 3rd Bomb Group requested additional Douglas A-20 Havocs, although both types were used in composite flights. In January 1945, the 319th Bomb Group was recalled to the United States and converted to Invaders from Marauders. 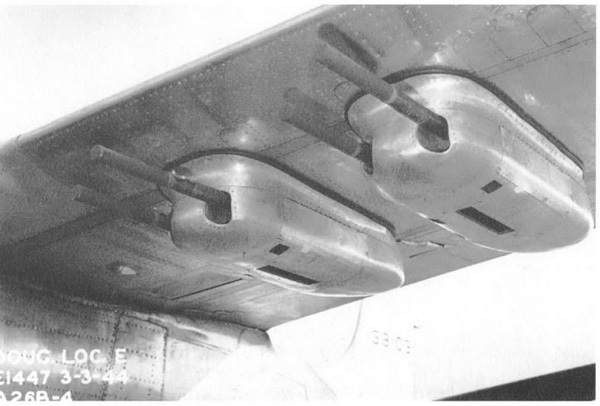 When the Invaders returned to the 3rd Bombardment Group in the summer of 1945, clam shell doors were installed on the canopy replacing the greenhouse cockpit—thus greatly improving visibility. Armament was increased to include six internally mounted 0.50 caliber wing guns rather than drag-producing blisters and eight 0.50s were placed in the nose. They were assigned to the Seventh Air Force and flew missions from Okinawa, bombing the Japanese homeland and enemy bases near Shanghai, China. 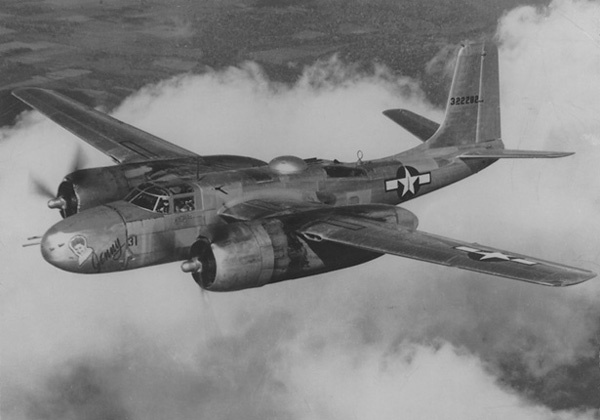 The A-26 operations wound down in mid-August 1945 with only a few dozen missions flown. When the Invader returned to the 3rd Bombardment Group in the summer of 1945, eight 0.50 caliber machine guns were installed in the nose. The Invader was faster than the A-20 Havoc and the range and bomb load were greater, and the 416th Bombardment Group, of the Ninth Air Force, began replacing its Havocs and B-26 Marauders with the Invader in November 1944. During March and April of 1945, the 386th and 391st Bombardment Groups of the Ninth Air Force converted to the Invader from B-26 Marauders and performed medium altitude missions with great success. In Italy, The Twelfth Air Force, received the Invader and these were assigned to the 47th Bomb Group in January 1945. They were used against tanks and troop concentrations in the Po valley in the final campaigns in Italy, and against German transport links. In the Mediterranean, the 47th Bombardment Group began receiving Invaders in January 1945 and were mainly used as night intruders and were successful at destroying a large number of vehicles that were forced to travel at night because of daylight attacks. When World War II ended, the Invader remained active with some light bomb and reconnaissance units in the USAAF. In 1947, the US Air Force became independent of the US Army and deleted the designation "A" (for attack category). The Invader was designated the B-26, often causing confusion it with the Martin B-26 Marauder. Many Invaders were relegated to Air National Guard and Reserve Units, but it wouldn�t be long before the Invader would go to war again. In January 1951, 111 Invaders were loaned to the French for use in the Indo-China war. After a cease fire in 1954, 85 airplanes were returned to the USAF. In 1950, the French also used Invaders in Algeria for counter-insurgency operations and a small number were used as night fighters. In 1950, Invaders were called in for duty for the Korean War and participated in the first attack on a North Korean airfield at Pyongyang on June 29, 1950. Eighteen Invaders of the 3rd Bombardment Group destroyed 25 aircraft on the ground and also shot down a Yak 3 during the mission. The 3rd held the line until they were joined by the 452nd Bombardment Wing in October 1950. They were stationed in Japan until 1951, when the 452nd went to Pusan, and the 3rd went to Kunsan in Korea. Invaders flew both low and medium-level missions attacking enemy troop columns, ground transports, and tanks. B-26Cs with the glass nose were used to lead the hard nose B-26Bs on medium-level missions against bridges, road junctions and railways. In the summer of 1951, one B-26B had an 80 million candlepower searchlight installed to illuminate ground targets at night, but this was discontinued rather quickly as the aircraft became an easy target for ground fire. In May 1952, the 17th Bombardment Wing was sent in to replace the 452nd. Invaders of the 17th and 3rd Wing were involved in the last combat mission in Korea on July 27, 1953. When the Vietnam War began, war weary Invaders were once again called to service. As the war dragged on, Invaders were rebuilt as B-26Ks. The On-Mark Engineering Company performed the modifications and they were upgraded with 2,500 hp Pratt & Whitney R-2800-103-W water-injected engines. Fuel capacity was increased by adding tip tanks for longer range, and armament was upgraded. Three 0.50 caliber machine guns were installed internally in each wing and eight 0.50s were installed in the nose. 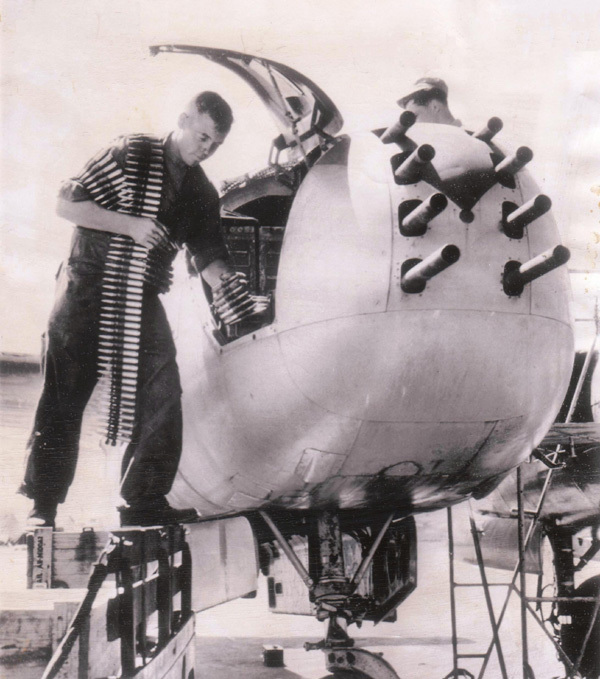 It also had provisions to do quick nose changes for medium-altitude bombing or reconnaissance missions. They were primarily operated by the 606th Aero Commando Squadron and were based in Phanom Air Base in Thailand. They were retired in 1969. 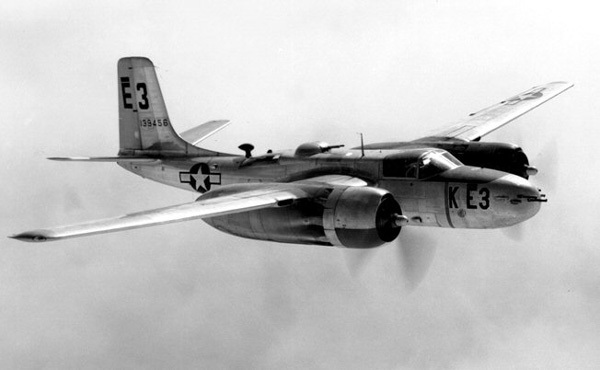 The A-26 was the last propeller-driven twin-engine production bomber produced for the USAAF and was one of the few wartime aircraft types still in service with the post-war US Air Force. Douglas built 2,503 A-26/B-26 Invaders and the last US military Invader retired in 1972. Pratt & Whitney R-2800-79,71,79 Double Wasp engines. Six 0.50 caliber machine guns. 4,000 lb (1,814 kg) bombs in an internal bay. Six 0.50 caliber machine guns. 4,000 lb (1,814 kg) bombs in an internal bay. 1. Kenneth Munson. The Pocket Encyclopedia World Aircraft in Colour, Bombers 1939-45. London: Blanford Press, 1969. 123. 2. David Mondey. The Concise Guide to American Aircraft of World War II. New York: Smithmark Publishers. 1996. 107. 3. Ren� J Francillon. McDonnell Douglas Since 1920: Volume I Annapolis, Maryland: Naval Institute Press, 1988. 338-355. 4. William N. Hess. A-20 Havoc at war. New York: Charles Scribner's Sons, 1979. 102. 5. Ray Wagner. American Combat Planes. Garden City, New York: Doubleday & Company, Inc., 1982. 187.